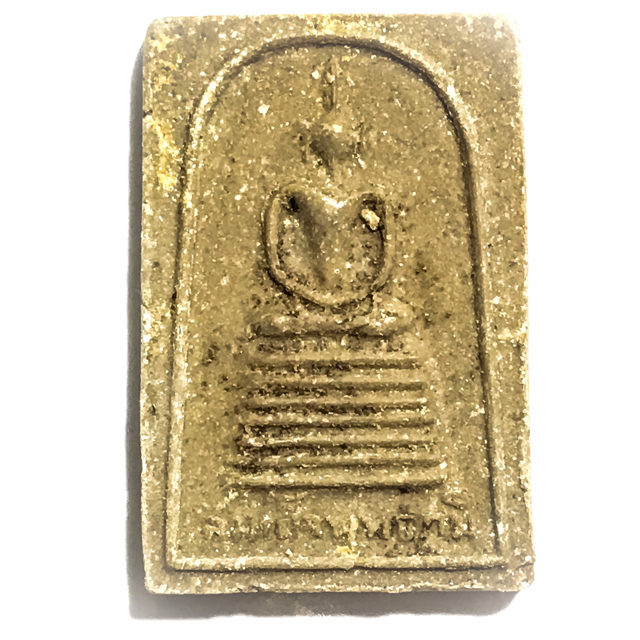 The Pra Somdej Puttapoom 'Buddha-Lands' Votive Tablet is a Pra Niyom amulet that is highly prized by the devotees of Luang Por Jong, preferred for the fact that it is both beautiful and powerful amulet from a great master of the Indo-China Wartime Era, but is also much more affordable than many other amulets from Luang Por Jong. Released in a large Buddha Abhiseka Blessing Ceremony in Year 2504 BE, this Pra Somdej amulet is an exemplary exhibit, and extremely attractive in appearance. Apart from the great Luang Por Jong, a further 26 Guru Master Monks present to assist in empowerment. The Pra Somdej Puttapoom was blessed in the very same ceremony as the legendary Pra Somdej Kampaeng Gaew series od immortal fame, with the powerful magic of the Great Luang Por Jong Wat Na Tang Nork. This classic and most beautiful Buddha amulet was empowered by Luang Por Jong at Wat Ban Kluay, in Amper Ta Wung, in Lopburi Province, in the year 2504 BE. Luang Por Kam Mee (Wat Tham Koo Ha Sawan), Luang Por Pring (Wat Bote Goeng Tanu), Luang Por Mee (Wat Khao Samor Don), Luang Por Chay (Wat Pha Dhamma Sopon), Luang Por Pan, Wat Payakkaram, Luang Por Dam (Wat Sao Thong Tong), Luang Por Say (Wat Laiy), Luang Por Sopit (Wat Ramparam), Luang Por To (Wat Saket), Luang Por Mora from Burma, who was staying at Wat Nikom, Luang Por Go (Wat Lad Sali in Lopburi), Luang Por Gep, (Wat Suan Lamyai, Chainat), Luang Por Tong (Wat Khao Jakkajan), Luang Por Jaran (Wat Ampawan), and Luang Por Khai (Wat Khao Wong, Nakorn Sawan). The amulets in this edition were commissioned by Pra Sopidhammasat, the Abbot of Wat Ban Kluay, to celebrate the casting of the Chor Fa roof struts of the Uposadha Shrine Room, and the Buddha Abhiseka Empowerment of the Pra Gaes Pra Gaew Buddha images of Wat ban Kluay. Buddha Abhiseka ceremony was held on the 25th to the 31st March in 2504. 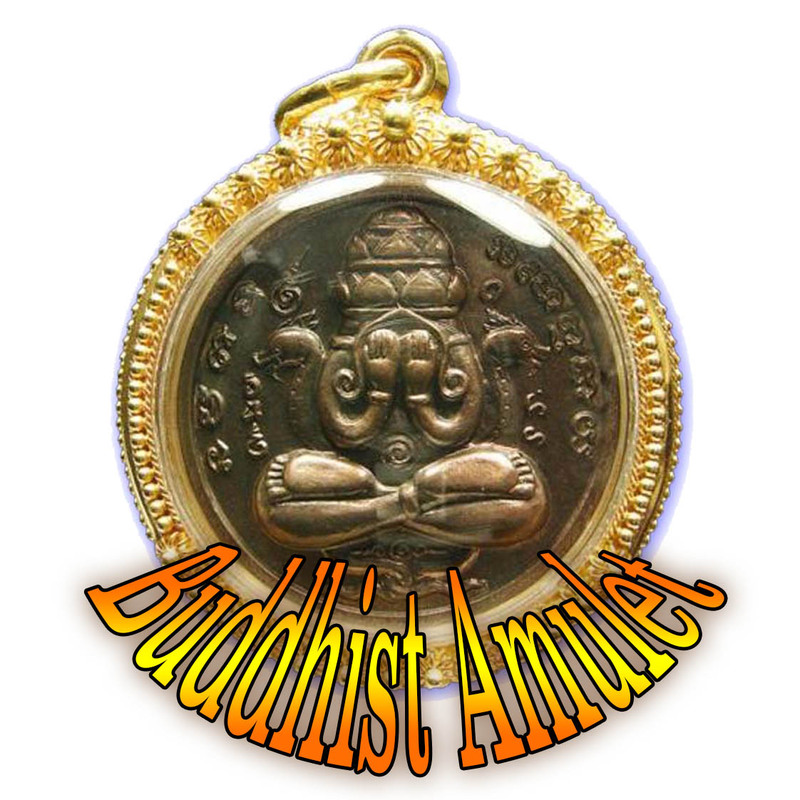 Along with the Pra Somdej Buddha Bhumi amulet, the editon was also accompanied by the Pra Somdej Gampaeng Gaew amulet, and the Pra Kring Gaes Gaew amulets, which were also blessed beginning on 25th March, in the same Buddha Abhiseka. They were then empowered for 7 days and nights with meditative empowerment and Chanting. A classic essential rarity and perfect Buddhanussati Heirloom Amulet with the blessings of Luang Por Jong and 26 other great Masters, for Kong Grapan Chadtri Klaew Klaad Maha Lap Metta Mahaniyom, and Serm Duang Blessings, and a most exemplary showpiece for any collector's showcase. Luang Por Jong of Wat Na Tang Nork was one of the great Guru Masters of the Ayuttaya Province, in line with the Great Luang Por Parn of Wat Bang Nom Kho, and is one of the Great Masters who assisted the Thai Military with powerful Kong Grapan Chadtri and Klaew Klaad amulets during the Indochina Wars. Luang Por Jong was a Highly Attained Master in both Worldly Deeds of Goodness and Self Renunciation, as well as in the Dhamma Path. His Great Fame and Honorable Status has survived more than half a century, and who is remembered as one of the Greatest Masters of His Time, and as one of the Greatest Masters of the Ayuttaya Lineage. Luang Por Jong lived from 2415 BE to 2508 BE, and was one of the previous generation of attained Masters, of National and International Fame. Known for his Kong Grapan Chadtri Klaew Klaad protective amulets handed out to soldiers during the Indochina Wars, his Pla Tapian Maha Lap Kaa Khaay amulets are also renowned for their ability to instigate good commerce and prolific sales quotas with sales persons. Luang Por Jong, was a famous Gaeji Ajarn Guru Monk, highly revered for a vast pantheon of different amulets, but if there is one section of that Pantheon that stands out above others for its Kong Grapan Chadtri and Klaew Klaad Magic, it is his Takrut Amulets. Luang Por Jong made a variety of different Takrut charms, ranging from Takrut Tone Dtakua (Leaden Yantra Foil), Tong Daeng (Copper Foil), Hnang Suea (Tiger Skin), and other combo-Takrut on waist cords or wrapped in cord with lacquer. There is a particular faction of collectors who specialise purely in the collection of Takrut of Luang Por Jong, and this is a category in itself that is accepted for Competition in many Amulet Shows and Competitions. His Takrut 'Hnaa Phaag Suea'(Tiger forehead skin), are amongst the more difficult to find amulets, and are very jealously guarded by their owners. This is not strange, considering how so many tales of Miraculous Events arising from the amulets of Luang Por Jong during the Indo-China War have endowed his amulets with Immortal Fame, and the Unwavering Faith of the Devotees who worship them. Yet another Classic and Essential Rarity, for the Devotee who needs true Protective Magick from the Olden days Masters, from a time before Buddhism became Commercial, and when special amulets like this, were still hand made one by one by the Masters. This, when calculated from knowing the Year of Monkey during the Reign of King Rama 5, within Luang Por Jongs childhood, would mean he would have been born on the 6th of March 2415 BE. During his childhood he displayed strong leanings to remain in solitary, and even when his parents would take him to the local Lige theatre shows, he would distance himself from the crowd of spectators and watch from a distance. He was never one to socialise or look for attention. Luang Por Jong was ordained in 2435 BE at Wat Na Tang Nork temple in Ayuttaya, and was given the ordained name of Jong Puttassaro with the Abbot of Wat Na Tang Nork as his Pra Anusawanajarn (Luang Por Po). 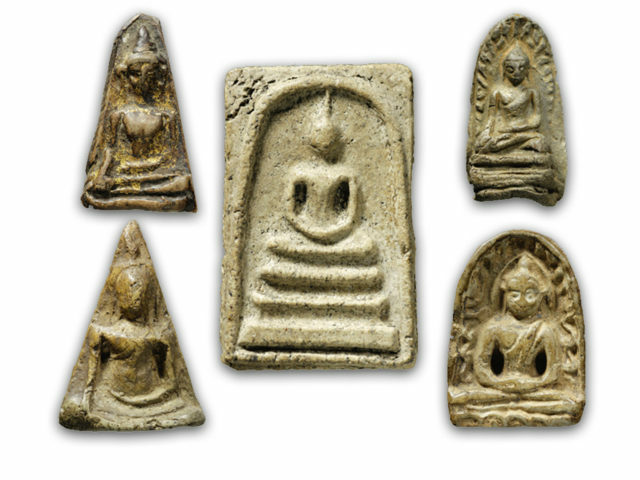 The Pra Somdej Buddha Bhumi (Puttapoom) and Pra Somdej Gampaeng Gaew amulets were never intended to become famous, and were originally intended as a Merit Maker, but their Legendary status happened naturally very quickly, as devotees with the amulet traveled around the country, and discovered immense Maha Sanaeh Metta Maha Niyom attraction, that people would notice the amulet for their individuality and sacredness. In a short period of time after the release, many devotees began to flock to the temple from around the country to ask for amulets, be it the Pra Somdej Buddha Bhumi and Gampaeng Gaew, and the Pra Kring Gaes Gaew amulet. Klai Sima (broken pieces of temple boundary stone) from the following temples; Wat Pha Gaew (Ayuttaya), Wat Chum Gaew (Pathum Tani), Wat Ang Gaew (Samutr Sakorn), Wat Gaew (Lopburi). Earths from seven of the Sangwechaniyasathaan (Buddhist Shrines which mark the sites of Important Events in the Buddha's life, e.g. his Birthplace, the place where he became Enlightened, and the place where he entered Nibbana).